Description: Bryan-Southwest Transfer and Storage Company employee and equipment maneuvers shipping containers from Travel Air Manufacturing Company at Missouri Pacific Railways tracks in downtown Wichita. Container was bound for Western Pacific Air Transport in Honolulu. Buildings in background include offices of Wichita Sash & Door, Dolese Brothers Company and Western Glass Company and Sedgwick County Courthouse. View is looking northeast. Keywords: Wichita, aviation, business and industry, transportation, buildings. Description: Charles A. Lindbergh (left) and Walter H. Beech pose in front of Travel Air 6000 airplane. Photograph taken in Wichita on February 3, 1929. Keywords: Wichita, aviation, people, business and industry. Description: Framework for Cessna Aircraft Company plant erected by George C. Christopher & Sons Iron Works. Completed in 1929, Cessna plant located on East Franklin Road (now Pawnee Street) on site of present plant known as "Pawnee Plant." Keywords: Wichita, aviation, business and industry. Description: Looking toward the northwest corner at the intersection of Lawrence (now Broadway) and Douglas Avenues. 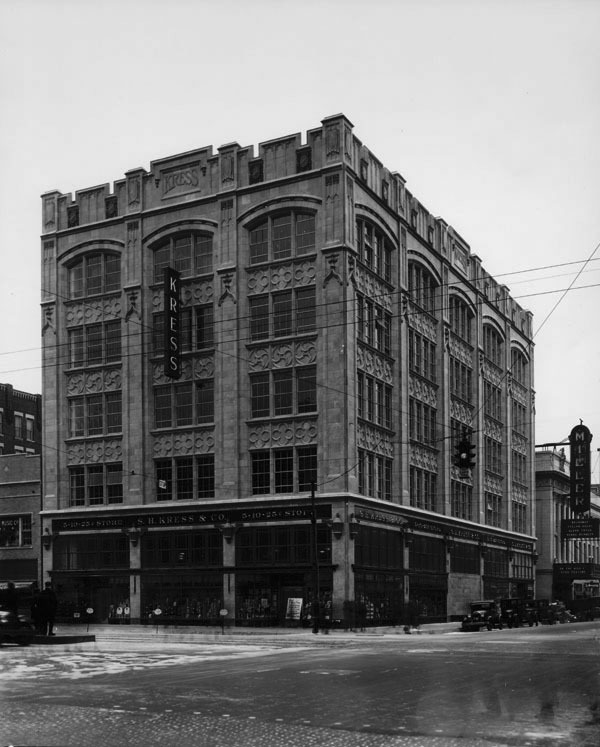 The Kress company replaced a former building on this site (224 East Douglas) with this elegantly styled building on the prospect that it would encourage sales. The structure is listed in the National Register of Historic Places. Other businesses in view include the Miller Theatre (115 North Lawrence), Schnoor Chocolate Company (115 North Lawrence), Miller Recreation/Billiards (3rd floor, Miller Theatre Building), Puls Music Company (220 East Douglas). Keywords: Business and industry, Commercial Gothic, architecture, five and ten-cent stores, five and dime, dime stores, chain stores, Wichita. Description: Side view of Travel Air biplane manufactured in Wichita and owned by Harvard Flying Club. Model E-4000 was three-place biplane. Photograph was taken August 30, 1929. Description: Santa Claus climbing into a Stearman airplane at hangar at Wichita Municipal Airport in city's southeast section. Keywords: Wichita, aviation, airports, airplanes, Santa Claus. Description: View of zoo in Central Riverside Park. Built in 1921 and remodeled in 1927, structure was scheduled to be torn down in 1973, the same year as new Sedgwick County Zoo opened. Description: Travel Air Model R monoplane known as the "Mystery S" or "Mystery Ship." Designed by engineers Walter Burnham and Herb Rawdon, it was first civilian aircraft to defeat military one in annual National Air Race in 1929.